Whole fish, like this one prepared by Chef George Chen from China Live, is a dish that brings good luck and fortune during Lunar New Year. SAN FRANCISCO (KGO) -- A big part of Lunar New Year is feasting with family, and behind each traditional food eaten during the celebration is a special meaning. Popular dishes include fish for prosperity. "If you have plenty of fish in the river in front of your home, you'll never go hungry," is a common saying. Noodles are always on the menu because they are long and represent longevity. Niao Gao are sticky rice cakes and are eaten to symbolize the desire of families to "stick" together. And a must-have is dumplings. Not just eating them, but making them together as a family activity. Dumplings are said to resemble gold nuggets and it is believed that eating them brings wealth. While every family has their favorite dumpling recipe, we asked famed San Francisco chef- restaurateur George Chen for his recipe. Chen's Eight Tables restaurant was recently named one of the "World's greatest places" by Time Magazine. He is also behind China Live, an award-winning Chinese marketplace and restaurant that's transformed San Francisco's Chinatown. 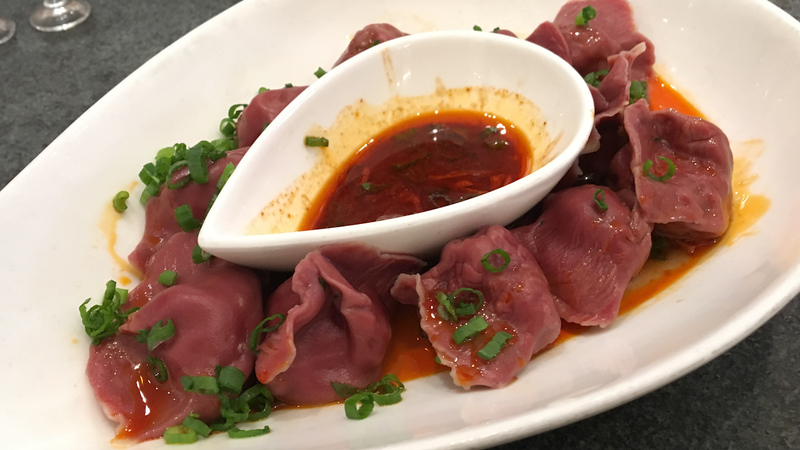 Red water dumplings prepared at China Live in San Francisco. In a small bowl, whisk together 1 teaspoon of sesame oil, soy sauce, vinegar, cornstarch, salt, ginger, and pepper into a medium bowl and stir vigorously with a rubber spatula to combine. Add ground pork, chives or scallions, cilantro and mix until the texture is even and you can make a meatball without it falling apart. Line a rimmed baking sheet with parchment paper and sprinkle with flour so dumplings don't stick together. Working with one wrapper at a time, put a tablespoon of pork filling onto a wrapper, fold wrapper in half, and seal it with water around the inside edge. Fold the wonton into crescent shape halves. With the half moon resting in your palm, use the thumb and forefinger of your other hand to grip a single edge of the wrapper near one corner of the dumpling. Fold the edge of the wrapper inward, about halfway toward dumpling's center; The easiest way is to press and pinch the sides to the middle to create that crescent shape. Transfer each dumpling to reserved baking sheet; cover with a damp towel. In a pot, bring 6 quarts of water to a rolling boil, add dash of sesame oil and a pinch of salt into the boiling water. Working in batches, boil dumplings until filling is cooked through, about 8 minutes. When they are floating, they are generally done. Using a slotted spoon, transfer dumplings to a platter. Do not drain completely. It is recommended to leave a few tablespoons on boiling water on the dumplings to keep them from sticking and for a better mouth feel when dipping. Make dipping sauce by combining reserved sesame oil, soy sauce, vinegar, grated ginger and/or garlic, pinch of salt. Add chives or scallions and chile pepper to taste. Heat quickly in a pan to bring the flavors together. Serve hot with dumplings.